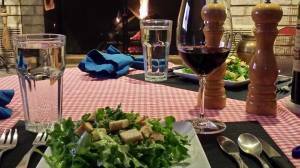 Do you know how to make croutons? This is a super simple “recipe” but one for which I’ve received a number of requests. 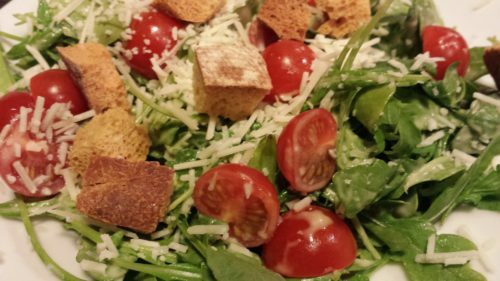 Nothing’s better than a fresh green salad or a bowl of steaming tomato soup with a few crispy croutons topping it. 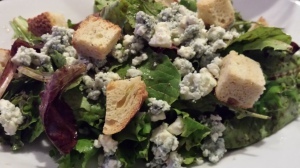 Croutons are an easy way to get some “crusty bread” taste to your salads. 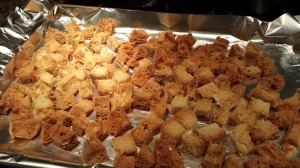 Crispy croutons go right along with my recent posting on Eating Healthier as you can get just a taste and crunch of bread without all the calories. I love to throw a few croutons on my favorite hot soups as well. 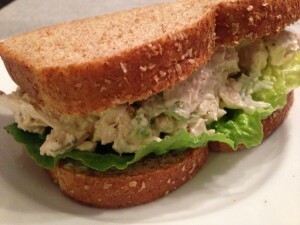 It’s a great way to use up leftover slices of bread from a larger loaf. Use your favorite bread. 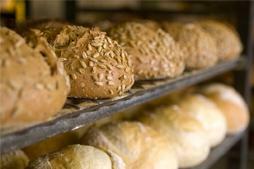 Pumpernickel bread, French baguette, and crusty Italian breads are all good choices. 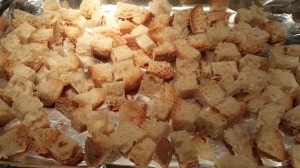 You can use cornbread, pumpkin bread, brioche, and other sweeter breads for croutons on your fruit salads. Once, I made some croutons out of cinnamon raisin bread. 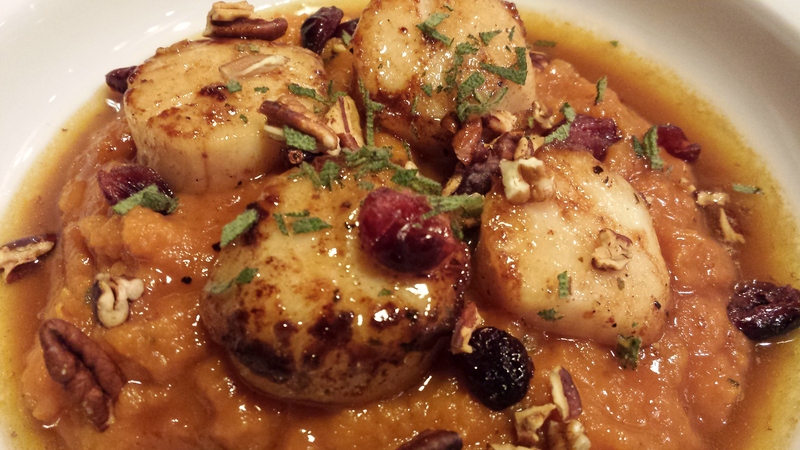 I used them on my Pretty Pear Salad with Goat Cheese instead of using the cinnamon pecans and also topped my Velvety Butternut Squash Soup. I like to use “day old” or slightly dried out bread for my croutons. 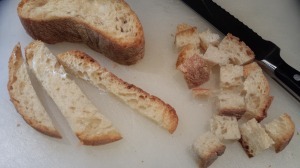 The bread in these photos below is from a loaf of Whole Foods Market‘s ciabatta bread. 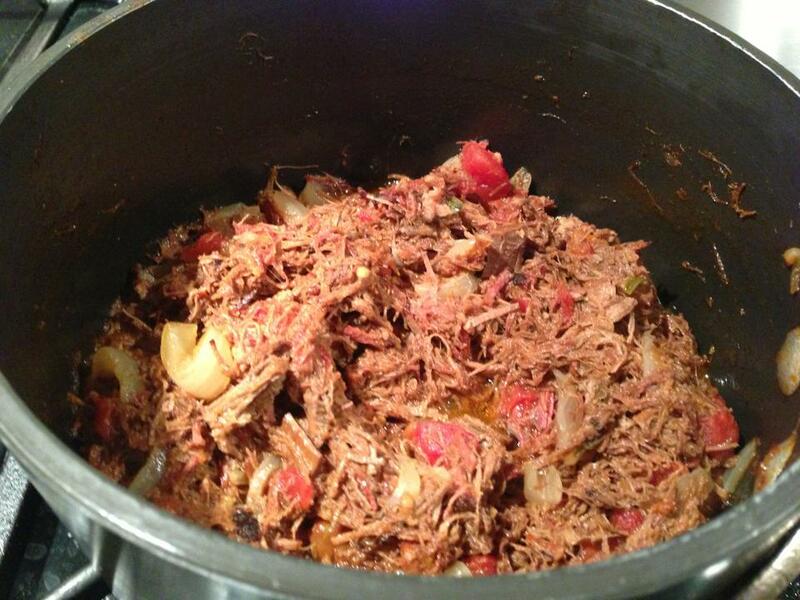 We had some leftover slices from a spaghetti and meat sauce dinner earlier in the week. Using a serrated bread knife , just slice the bread into 1 to 1/2 inch cubes. Keep the crust on the bread for a crunchier taste or remove it for a cleaner look. In keeping with my “healthier eating” goals, I don’t use butter or oil to make these croutons. I just bake them plain. Just dice the bread and spread out on a foil-lined baking pan. If you really want a buttery flavor to your croutons, spray them lightly with a butter-flavored cooking spray, or brush them lightly with melted butter. I find that using the butter or oil will keep the croutons from staying crispy and they will spoil quickly. Bake the croutons at 350 degrees Fahrenheit just until they turn a nice golden brown. Remove the pan from the oven and let the croutons cool. The crispy croutons will keep in an airtight container or Ziploc bag in the refrigerator or freezer for a month…if they last that long. Of course, you can add some dried herbs to the container for herb-flavored croutons. Or you could add some garlic powder for garlicky croutons. Just toss the seasoning and the croutons together a bit before storing. I personally like my croutons plain so they just add a nice crunch to my salad, and don’t compete with my herby dressings. 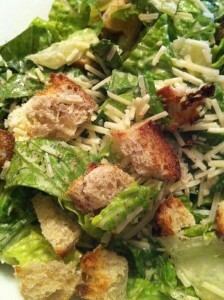 Try your croutons on a few of my salads! 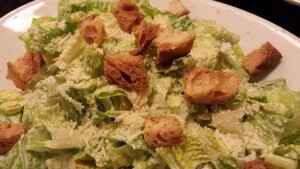 My favorite salad for croutons is my Hubby’s Caesar Salad followed closely by my Chicken BLT Salad. Also, my His-and-Hers Steak Salads would benefit from a sprinkling of crispy baguette croutons! Try these croutons on soups such as my Tomato Basil Soup and my Creamy Broccoli Soup with Cheddar and Bits of Ham. 1. Preheat your oven to 350 degrees Fahrenheit. 2. Slice the bread with a serrated bread knife into 1/2 inch or one inch cubes. 3. Spread the bread cubes out onto a foil lined baking sheet. 4. Bake the bread cubes, stirring once or twice, until the cubes are golden brown. 5. 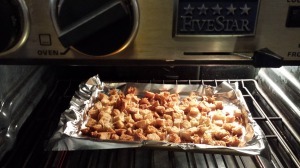 Remove the baking sheet with the croutons from the oven, and let the croutons cool. 6. Store the croutons in an air-tight container or a Ziploc bag in the refrigerator or freezer for up to a month. You don’t have to “thaw” out the croutons prior to use. They will come to room temperature quickly. 7. Sprinkle on a salad and enjoy! Makes about 2 cups of croutons depending on the size of your bread slices. Variations: Add some garlic powder or dried herbs to the croutons and stir before storing in the refrigerator or freezer. If you really do want a buttery taste to your croutons, you can lightly spray them with a butter-based cooking spray prior to baking them.